Saliva is just an example for a complex “viscoelastic” fluid; other fluids that share these characteristics include shaving gels and shampoo, which contain long chains of molecules called polymers. In the case of saliva, the polymers are proteins known as mucopolysaccharides. In comparison, liquids such as water and other so-called “Newtonian” fluids do not form beads when stretched, because they lack dissolved polymers. 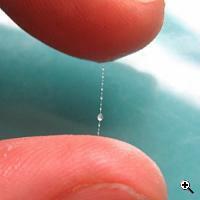 Professor Gareth McKinley from the Massachusetts Institute of Technology (MIT), along with researchers from Purdue University and Rice University found that the elasticity of a fluid is not the sole factor affecting the “beads-on-a-string” phenomenon. Apparently, another key contributing factor in the beading mechanism is fluid inertia, or the tendency of a fluid to keep moving unless acted upon by an external force. Their latest article, published in Nature Physics, details other major elements including a fluid’s viscosity: The time it takes a stretched polymer molecule to “relax,” or snap back to its original shape when stretching is stopped. In addition, the “capillary time” – how long it would take for the surface of the fluid strand to vibrate if plucked – determines the probability this phenomenon will occur. “What makes this result a breakthrough is that bead formation is more complicated than a lot of people had assumed,” said Yuriko Renardy, professor of mathematics at Virginia Tech University. According to the researchers’ study, the bead formation depends on a delicate balance of two ratios: the viscous force compared to inertial force and the relaxation time compared to the capillary time. The insight that inertia matters is a surprise. “Earlier attempts to explain this phenomenon without inertia are either wrong or assume inappropriate physics,” Renardy says. Hopefully, understanding how these beads arise will enable researchers to design systems capable of precisely controlling the formation of the beads. Possible results include improvements in various technologies, such as inkjet printing. Furthermore, the information might be used to develop drug-dispensing systems for patients with certain disorders that require precise doses of medication depending on daily blood measurements. For more information about the “beads-on-a-string” phenomenon, see MIT’s press release.